Shape optimization is concerned about finding optimal designs under the aspect of some cost criteria often involving the solution of a partial differential equation (PDE) over the afore said unknown shape. In general, industrial cases involve a geometric model from Computer Aided Design (CAD). However, solving PDEs requires an analysis suitable working model, typically a Finite Element (FEM) triangulation. Hence, some of the geometric properties known from the CAD model may be lost during this format change. Therefore, we employ isogeometric analysis (IGA) instead, which has a tighter connection between geometry, simulation and shape optimization. 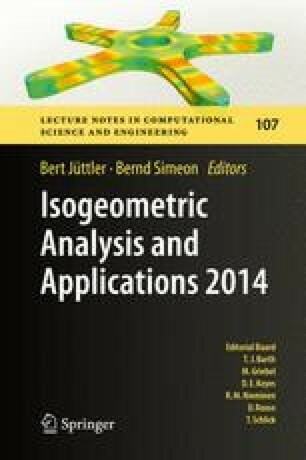 In this paper, we present a self-contained treatment of gradient based shape optimization method with isogeometric analysis, focusing on algorithmic and practical aspects like computation of shape gradients in an IGA formulation and updating B-spline and NURBS geometries. We thank Utz Wever from Siemens AG, Corporate Technology, for many helpful discussions on the subject. This work was supported by the European Union within the Project 284981 “TERRIFIC” (7th Framework Program).